Carmel CA, correctly Carmel-by-the-Sea, is a small town of around 4500 residents located on the coast of the Monterey Peninsula. The village is best known of its lively arts and theater community, its quaint cottage buildings, and its famous residents. Among Carmel's notable residents are Clint Eastwood (the former mayor of the town), Betty White, Doris Day, and Jennifer Aniston. Past residents include authors Jack London, Robert Louis Stevenson, Upton Sinclair, and Sinclair Lewis as well as photographer Ansel Adams. Carmel was first "discovered" by Europeans in 1542 when Spanish explorers sailed past the Monterey Peninsula. The area wasn't explored on foot until much later, in 1602, when Carmelite Friar Sebastian Vizcaino mapped the area and named it for his order's patron saint, Our Lady of Mount Carmel. The area began to be colonized in 1769 when Gaspar de Portola and Father Juan Crespi founded the Mission San Carlos Borromeo de Carmel on the site (see below). This area of California became part of the Mexican Territories and was ceded to the United States in 1848 after the Mexican-American War. The village of Carmel was founded in 1904 and was encorporated in 1916. Many of the village's early inhabitants were active in the arts and approximately 60 percent of Carmel's unique "cottages" were built in the early 20th century by those devoted to the "aesethic arts." Carmel Mission - Officially the Mission San Carlos Borromeo de Carmelo, this mission was founded in 1760, one of the later of the 21 Spanish missions that dotted the California coastline in the 18th century. In its heyday, the mission housed almost 1000 workers, monks, and clergy. 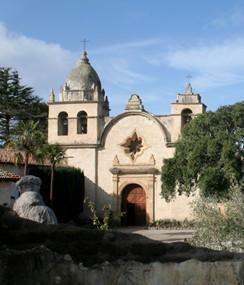 The mission at Carmel was one of administrator Father Junipero Serra's favorites and he is buried on the grounds. Today, the mission is a National Historic Landmark and one of the most popular attractions on the Monterey Peninsula as well as being an active parish church. Visitors can tour the chapel, the out buildings, and the former priory, all restored to their former elegance. Carmel Beach - The beach at Carmel CA is one of the prettiest cove beaches in the US. The half-mile stretch is coated with soft white sand with a backdrop of dramatic cliffs. The beach is public and free parking is available at the end of Ocean Avenue. It's also just a short walk from downtown Carmel-by-the-Sea. Forest Theatre - Founded in 1910, the Forest Theater was the first open-air theater west of the Rocky Mountains. An indoor theater was added to the complex in 1949 and the original theater was restored in the mid-1970s. Today, both theaters delight visitors and residents with a diverse schedule of dramatic, comedy, and musical presentations. Carmel Arts Community - Carmel is still known as a haven for artists of all genres. Downtown Carmel is lined with small art galleries, bookstores, and studios. It is a rare weekend that doesn't host some interesting art event in the village. Carmel is located about two hours south of San Francisco by car. The area is known for its small, picturesque bed and breakfast inns, scattered throughout the village. There are also larger, full-service hotels, such as the Hyatt, just outside of town along the highway. Although Carmel is a very walkable town, a rental car is advisable to visit the sites just outside of town, such as the Carmel Mission and to drive along the Monterey Peninsula.